The Zeitz Museum of Contemporary Art Africa (Zeitz MOCAA) is currently premiering a new fashion exhibition, titled 21 YEARS: Making Histories with South African Fashion Week. The exhibition features 21 ensembles from 21 designers, spanning different styles, multiple collections, and various seasons showcasing a micro-history of South African fashion. The exhibition will occupy two gallery spaces on Level 4 of the museum and runs until 7 January 2019. The exhibition is a collaboration with South African Fashion Week and draws on a curated selection of ensembles from their coming of age celebration of showcasing South African fashion since 1997. 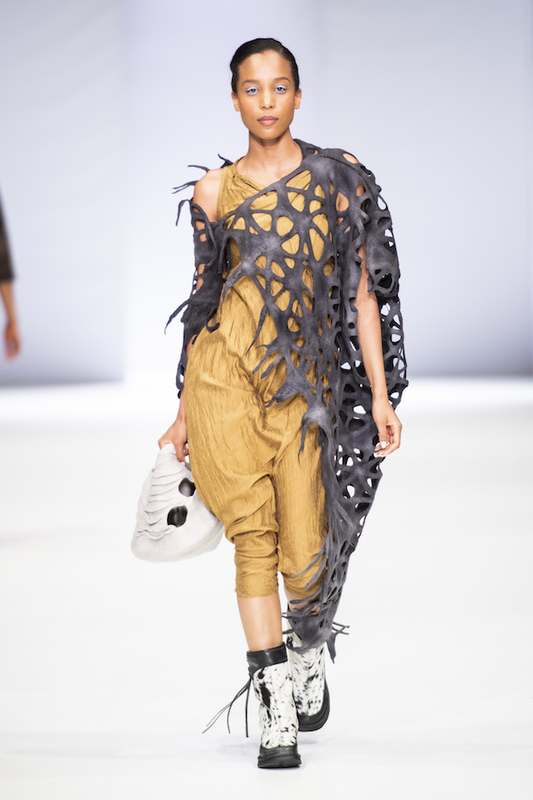 It offers museum visitors an intimate survey of iconic fashion designers, such as Clive Rundle, Amanda Laird Cherry and Loxion Kulca, alongside young designers that includes Sindiso Khumalo, Thebe Magugu and Selfi. This presentation of the exhibition is organised by Erica de Greef, Senior Curator at Zeitz MOCAA. “Much like art, fashion has the capacity to reflect the broader political, cultural, technological and creative transformation in post-apartheid South Africa”, she commented. 21 YEARS is an ongoing fashion-focused curatorial project of the museum that reclaims absent African fashion histories and writes into the record some of the neglected narratives through micro- history publications, exhibitions, and related workshops exploring, showcasing and archiving the history of a single event, magazine, maker, retailer, photographer, and more. The concept of 21 YEARS draws on a millennial approach to owning and narrating diverse and unique fashion histories. The debut micro-history exhibition follows the story of the first fashion week launched in Africa, South African Fashion Week, founded by Lucilla Booyzen in 1997. 21 YEARS: Making Histories with South African Fashion Week presents the opportunity to begin reflecting on and recording the many neglected fashion narratives from the continent. “In a continent where fashion has played such pivotal roles in crafting identities, politicising bodies, and engaging modernities, it is critical that African fashion narratives are afforded new forms of attention in museum spaces,” de Greef commented. The publication, will be available for purchase in the Zeitz MOCAA Shop, at R1 330 inclusive of VAT. Exhibition curator: Erica de Greef, Senior Curator, with Lesiba Mabitsela and Githan Coopoo, Curatorial Assistants.